If you’ve got trees growing in your backyard then you probably know by now that they require routine maintenance, either by a professional tree service Brandon, FL or through your own DIY efforts. For example, it’s mandatory to cut tree branches every once in a while before they get too big, and while it might seem like a straightforward process, cutting off the limbs of a tree needs to be done in a certain way that won’t affect its natural healing process. Here are some tips on how to trim tree branches without damaging them. First, it’s important to acknowledge here that trees heal differently to humans. Right after you cut off one of its limbs, the tree starts producing a unique callus tissue that’ll cover the entire area where the limb was cut off. This scar will always be visible on the tree and it’s meant to protect it from getting infected with a disease while allowing the other limbs to continue growing as per usual. Incorrect tree felling exposes the tree to potential infection and can stop its growth as well. Step One: The first step (or cut as it’s known) involves making a small indentation right at the bottom of the branch, about 2 feet or so from the trunk, making sure that the notch is only about a ¼ of the way through. You’re making this indentation in order to avoid splitting the bark when you move on to the next step. Step Two: Create a relief cut right next to the indentation you just made with the first step, so that the branch doesn’t split and fall when you make the final cut. Step Three: Look for a swollen bump on the branch, which is the point where the branch transitions from a collar to an even bark. Place your saw into the area where the branch collar slants, making sure that your saw is placed at the right angle, before cutting the branch off from the bottom up. Cutting the Branch Too Short: Cutting a tree branch from where it originates on the trunk (the collar) is always a bad idea. This is mainly because this area is exactly where the tree starts its healing process by forming scar tissue, and if you cut it from here, you’ll be seriously compromising the tree’s ability to heal properly. This mistake is the cause of those endlessly seeping wounds and holes that you sometimes see on trees. Leaving the Branch Too Long: The branch’s collar can only heal the wound when the branch has been completely removed to leave only the collar behind. If you leave a branch stub peeking out, then you’ll stunt the tree’s further growth by obstructing its healing process. 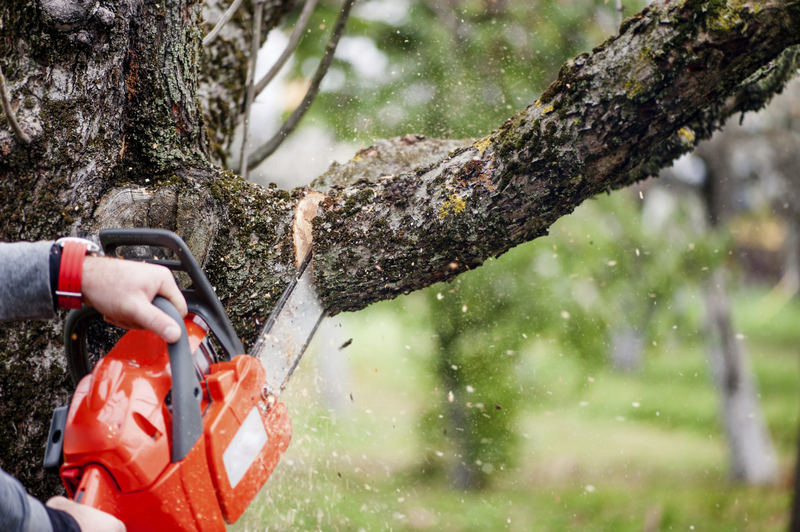 Not Making Relief Cuts: It’s important to make relief cuts prior to trimming the tree branch so that the branch doesn’t just split off haphazardly, as this will invite damage and infection to the tree limb. As you can see, cutting off a tree branch is fairly easy when you know what to do. However, if you’re not quite confident in your abilities, and don’t mind paying someone to do the job, then feel free to hire a tree trimming Brandon, FL professional.